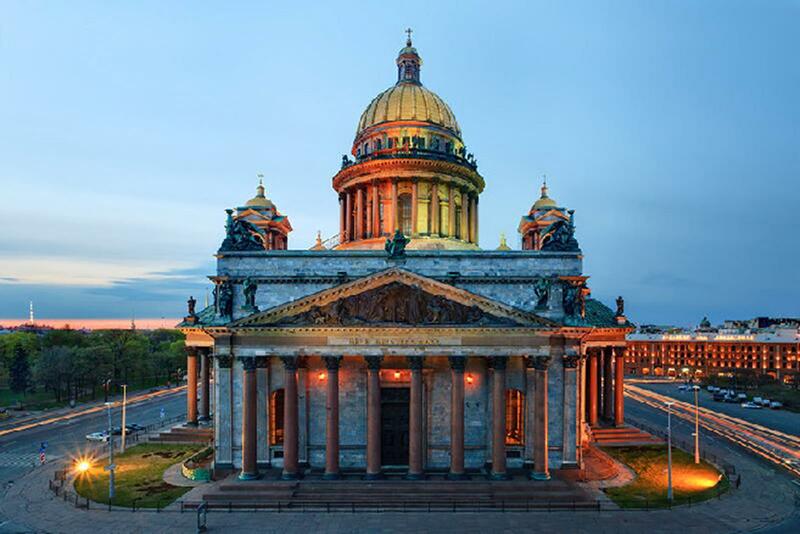 Conveniently scattered throughout the city of St. Petersburg, these are four cathedrals worth seeing. Dating back as early as the 1700s, the cathedrals brim with history, spirituality and beauty. While the churches still offer regular services, liturgies and prayer, they also provide museums, tours and artwork that will educate and enlighten your group. Ideal for a group visit, the Cathedral Ring is a bus tour to four of the most popular cathedrals in Russia, collectively known as the Museum. Your group will visit the St. Isaac, Sampsonievsky and Smolny cathedrals, as well as the Church of the Savior on the Spilt Blood. The tour, lasting roughly four hours, will let your group experience not only all four cathedrals, but also the beauty of the city with its waterways, bridges, buildings, parks and palaces. The three-hour boat tour is also an option; your group will begin at the Resurrection of Christ Church and float down the Moika, Neva, Kronverk branches and Fontanka Canal with splendid views of the city and churches, ending at St. Isaac’s Cathedral. 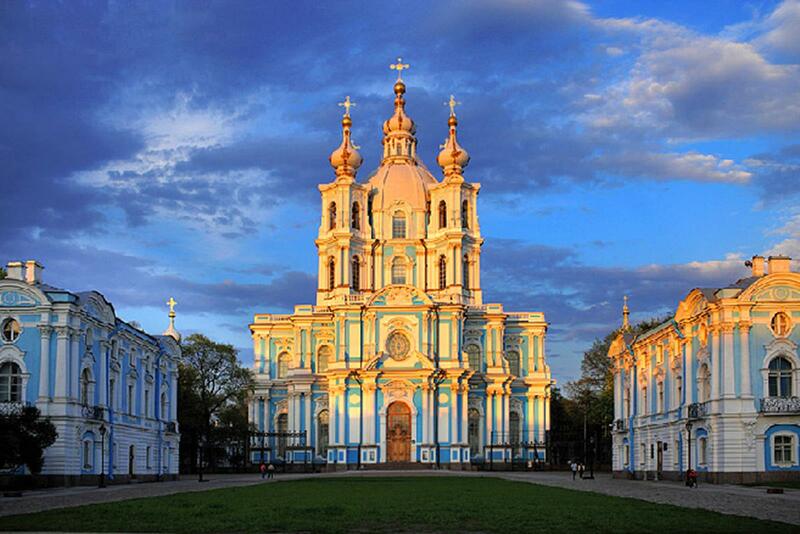 The largest cathedral in St. Petersburg, it is dedicated to “St. Isaac the Dalmatia,” a patron saint of Peter the Great. It started construction in 1818 and finished 40 years later in 1858. During the Soviet reign, it was removed of religious affiliation and served as the Museum of the History of Religion and Atheism. Soon after the fall of Communism, regular services were resumed in the left-hand side of the cathedral. Designed by architect Auguste Montferrand, its 19th century Russian architecture is profound—deeming it as an architectural landmark in the city. The exterior is complete with five golden domes, the largest in the middle. The contrast of dark-red granite columns, marble veneers and gold domes make a stunning statement. 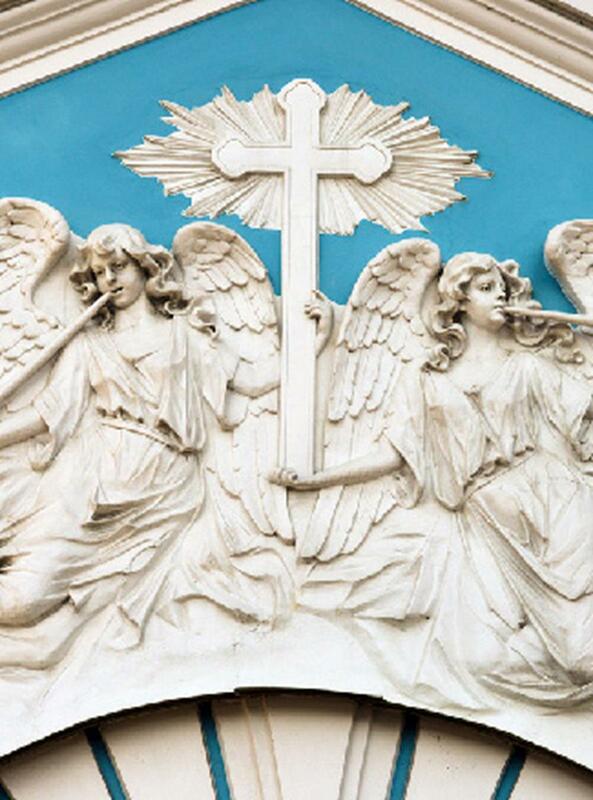 Religious sculptures—angels, archangels, apostles and evangelists, Christ carrying the Cross, the Lamentation and the Massacre of the Innocent—adorn the exterior. More than 350 works of art include paintings, mosaics, sculptures and colored stonework canvas the interior. The vaults and drum are sprinkled with copper sculptures of the apostles, prophets and angels. St. Sampson Cathedral Exterior Design. Credit. Standing in the northern outskirts, the charming light blue and white cathedral is one of the oldest churches in the city. It was originally built in 1707 as a wooden church to honor Sampson the Hospitable and Russia’s victory over the Swedes at the battle of Poltava. The church was renovated and elevated to cathedral status when Peter I’s address to his soldiers at Poltava was inscribed on the wall. Abandoned in the 1930s by the Soviets, it was restored with stone in the late 1970s and added a bell tower—home to the heaviest bell in town. The cathedral was renovated in 1761 when four small cupolas were added in traditional Russian style. The interior has collections of icons from the 17th and 18th centuries, an 18th century engraved iconostasis and an elegantly carved altar found during restoration. One of the first cemeteries in the city was placed right next to the cathedral, and some of the most important figures of St. Petersburg are at rest there. Luminous interior at Church of the Savior on Spilt Blood. Credit. dark name from Emperor Tsar Alexander II, said to be brutally assassinated on the grounds in 1881—where there is now a shrine of Alexander on the spot where he was killed. It was constructed as a memorial by Alexander III to his father from 1883-1907 and completed under the reign of Nicholas II. The church was primarily funded by the Imperial family and private donors, and later restored in 1997 after being termed a “garbage dump” in the middle 1900s. After decades of deterioration, its reopening was met with rave reviews. 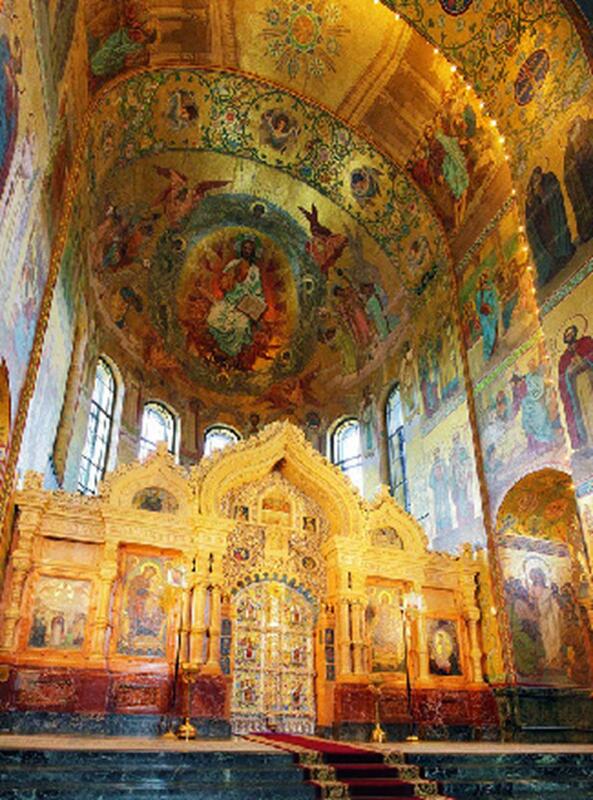 The interior gleams with multicolored mosaics depicting biblical themes by Russian artists of the day. In fact, it is often called the “Mosaic Church.” A great way to view the church is from Nevsky Prospect, St. Petersburg’s main avenue. After being disallowed from the throne, Elizabeth, daughter of Peter the Great, was forced to settle into a new way of living by becoming a nun; this would have been her convent. After plans of becoming a nun were set, Ivan VI was overthrown and Elizabeth regained her title and became the Russian ruler. This castle-like convent is considered to be one of Italian architect Bartolomeo Rastrelli’s masterpieces. Built between 1748 and 1764, the blue and white building was the centerpiece of the convent. Closed by Soviet authorities in 1923, it was salvaged in 1982 and reopened as a concert hall. Today, the cathedral is used mainly as a concert hall and also holds religious services. Overflowing with elegance, these grand cathedrals are a must-see while your group visits Russia. The Cathedral Ring is an opportunity not to overlook; your group will experience not only the traditional prayer and service at the churches, but also their history and how these places of worship came about. Add in the pleasure of touring the historical city of St. Petersburg. Europe, filled with dozens of religiously compelling cities and sites, is a prime spot for faith-based tour groups. The most spectacular architectural religious sites in all of Russia have withstood fierce weather, world wars and even plans to be demolished. Find out what makes these three sites so special.